In the heart of KwaZulu-Natal, at the foothills of the great Drakensburg lie many rural communities. Isolated and far from established agricultural markets, these people face many challenges; firstly in acquiring inputs for crops and secondly getting their product to a market. These communities have access to many hectares which could be contributing to food security as well as improving their livelihoods but unfortunately, due to the daily challenges they face, most of these hectares are unutilised and unproductive. Little to no government support is in place to assist these people. They have no secure land tenure rights, which makes access to production loans virtually impossible and much of the land is controlled by the chiefs and kings of these communities which poses further challenges to those who are willing to get their hands dirty to work the land. The sad fact is that there are many that are capable and willing, but few that are succeeding in overcoming these hurdles. Fortunately there are some private organisations and NGO’s who are making headway in assisting these communities and much success has already been achieved due to dedicated facilitators who commit themselves to improving the situations of these small scale farmers. One such success story can be found in the Magangangozi region near Emmaus in the Cathedral Peaks valley, about 30 km’s from the town of Winterton. This rural community is sparsely populated, spread out amongst the hills of the little berg and along the poorly tarred road which snakes through the hills. Most households cultivate one or two hectares around the kraals, but much of the available arable land is along the Mlambonja River with limited access for machinery and no protection from livestock which cause significant damage to crops. Here we find Mrs TO Mdluli, a 52 year old widow who is beating the odds. With the support of Grain SA’s Farmer Development Programme she is fast becoming an asset to her community and an example to many other small scale farmers. Mrs Mdluli lives in a humble dwelling traditionally crafted out of mud and thatch. Her yard is immaculately neat and cared for with much pride. Mrs Mdluli started farming in 2001 after her husband passed away leaving her to take up the responsibilities of caring for the family. She grabbed the opportunity with both hands and learnt as she went along. She regularly attends the Grain SA study groups which are held in a nearby community hall and what she has learned there has helped improve her production hugely. Mrs Mdluli only has access to 1,8ha, but she maximises the efficiency on this small piece of arable land as much as possible. She uses no tillage practices and does all the work by hand which allows her to save a lot on input costs. 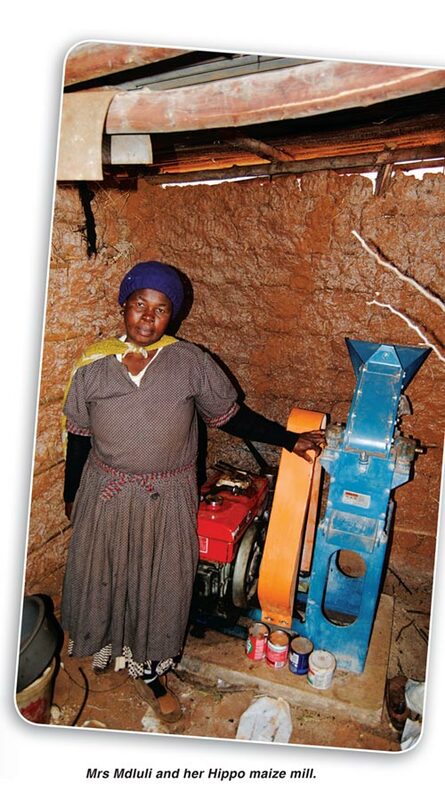 At a function in 2014, where Mrs Mdluli won the Subsistence Category of the Farmer of the Year Competition, Mr Kobus Steenekamp, South Africa Lead of Monsanto, was so impressed by her efforts that he decided to sponsor her by giving her a small Hippo maize mill to assist her business further. This has helped her and her community significantly as it allows them to have their maize milled locally, and has even created a small local market for their surplus maize. Most of the maize which she produces is put through the mill for own use and the rest is sold into the local community. Mdluli does still sell some maize in Winterton to get an occasional lump sum income, but it is very expensive to get her grain to that market place. She charges a small milling fee to her neighbours of R8 per 20 litre bucket of maize. She says it is little but she also wants it to be a service to her community – this saves the community members from having to transport their maize to town for milling and then to transport the meal home again. 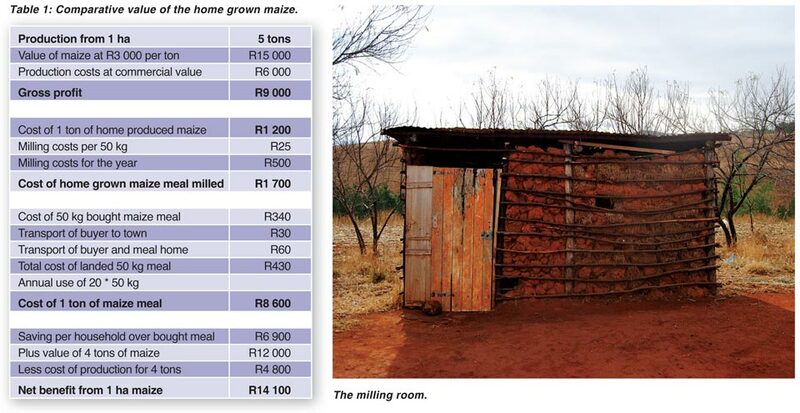 For a neighbour to bring a 50 kg bag of maize to be milled at Mrs Mdluli’s mill it will cost them approximately R25. If that neighbour paid for transport to town and purchased a 50 kg bag of meal it would cost them as much as R340, R250 for the meal and R90 for the transport. Most taxi’s will charge the same rate to transport a 50 kg bag of meal as they would to transport a person, therefore the neighbour will pay R30 into town and R60 back home with the bag of meal. This is a big service which Mrs Mdluli is providing indeed, and the savings which she and her neighbours are making can now be put into other essential needs like schooling, medicine and clothing for the children. Of course she still has many challenges to face. At the time of visiting Mrs Mdluli her maize mill was not operating as she had a small breakdown on the diesel engine which drives the mill. She has been struggling to get hold of Hippo to order a new part. This is another example of how isolation can be very challenging for these farmers and how support is always hard to find. Another challenge that she faces is that her mill only mills special maize meal and the people mainly like super maize meal which is much whiter and finer. But by keeping her milling fee down she still gets many neighbours wanting to mill their maize as it is much more cost effective for them to convert their crops into a finished product so nearby. Living in an isolated area will always have its challenges but if the correct assistance and support is provided to people such as Mrs Mdluli then we will see significant improvements in the livelihoods of these people. Government needs to get on board and start assisting smaller enterprises such as this one which provide a big service to the community. There is no need for huge outlay’s and investments. This country needs to facilitate small entrepreneurs like Mrs Mdluli if we want to see a reduction in poverty and an increased number of people involved in the rural agricultural sector. 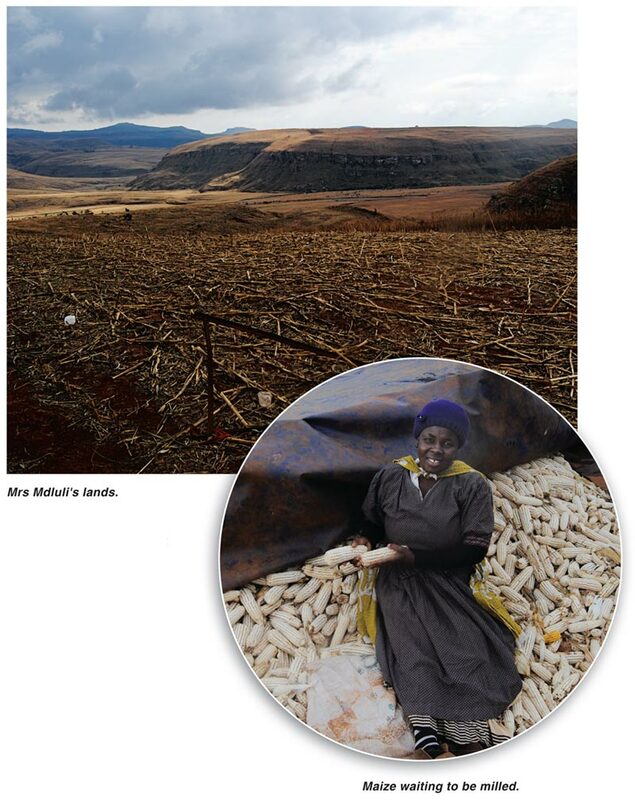 There is plenty of land available to many of these farmers especially in Mpumalanga, KwaZulu-Natal and the Eastern Cape; with a little help and support, there could be many more cases like Mrs Mdluli.